The average college student changes their major three times. After graduation, the average American changes their career (not job) three times (Bolles, 2000). 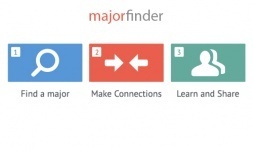 MajorFinder is a fun and easy way to find the perfect major, school, or career regardless of where you are in life. Best of all, you can connect with people, learn from their experience, and share you own advice. Home page, user login and registration (devise), major database, and major profile page completed. Home page, user login and registration, admin section, all databases, major profile, school profile, career profile, and people profile completed. Relationships and recommendation engine created (using recommendable gem). Use validated learning and innovative accounting (lean startup principles) in order to determine which features to add/edit/remove. Perform A/B test on new/changed feature. Use actionable metrics in order to guide majorfinder to growth or to pivot. Verify the need/interest for a major finder through sign ups, returning users, and activity on majorfinder. You can find my application in the works at majorfinder.com. I am open to changing it in any way that it needs to. Any thoughts you have would be really great to hear - I would appreciate them so much!